Anyone who reads this website will know that I'll fish for almost anything. I love catching bass and mullet from the coast but at times the conditions can be against good sport. Of course it's almost always possible to catch a fish or two if you choose the method and the place with care (and have a bit of luck) but these days I'm generally inclined to try some other sort of fishing which is likely to be more productive. 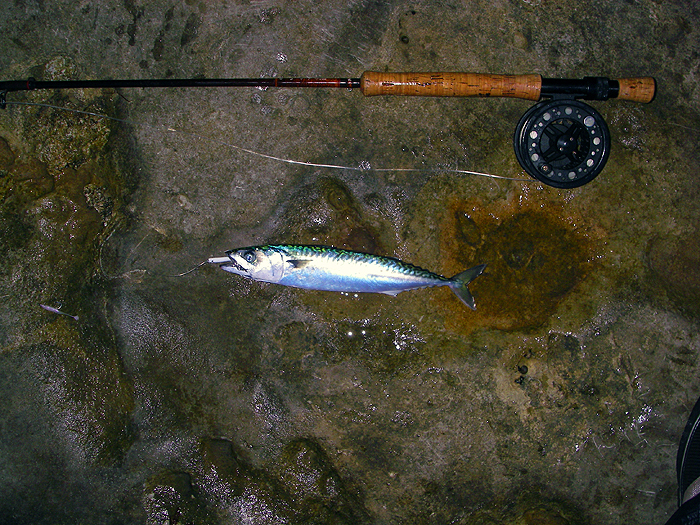 I'm not a fly fishing expert by any means but it's good fun to catch fish on the fly gear and there's the possible added bonus of a few mackerel to eat or for bait, plus the possibility of using a fly-caught mackerel as livebait. 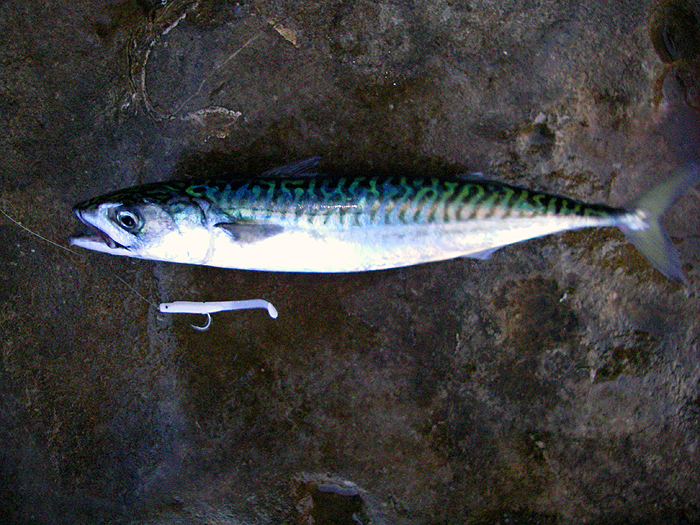 When they're caught on a small, single fly hook mackerel tend to be in mint condition and will swim for ever in their attempts to be eaten by a big bass. This week I decided to give the 'fly' a go so it meant an early start. 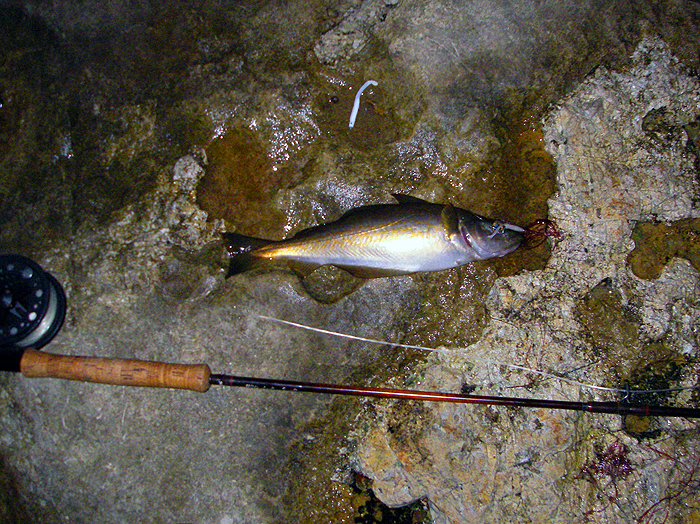 One common feature of fly fishing from the shore where I go is that often the fish only bite for perhaps 20 minutes as dawn is breaking (well before sunrise). I generally use a small (50-65mm) white Delta eel instead of a conventional fly. I replace the hooks with stainless versions so that they won't rust and I make sure that they are needle sharp (I still miss lots of bites). I sometimes add a dropper, not to catch two at once (although it happens) to see if the fish have a preference (It's still hard to be sure). A typical session would start in the pitch dark so it's a good idea to know exactly where you can stand to cast without being washed off, slipping or breaking an ankle. For five or ten minutes I'll cast and retrieve and there'll be no action at all. In my spots I generally just feed out enough line to make the rod 'work' and draw in an 'armfull' and a 90 degree sweep of the rod to work the fly. No need for false casting and aerialising miles of line - in fact it's a waste of effort and time if the fly isn't in the water. Try to maximise the actual period when the fly is 'fishing'. The first intimation that the fish are about to come on will usually be a tap on the line. 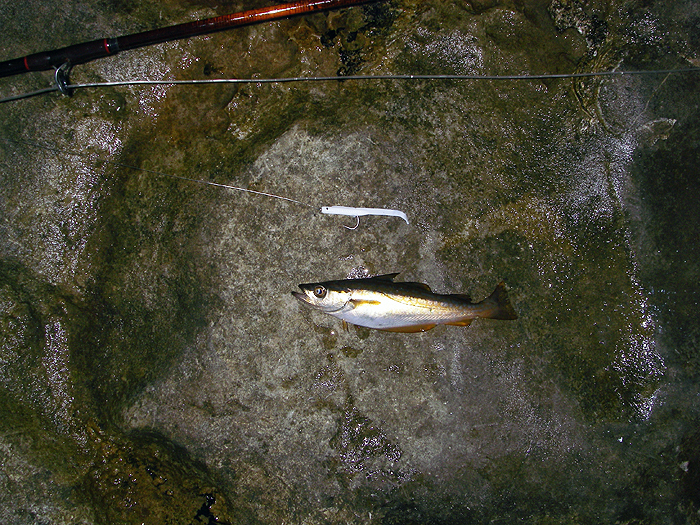 It will be easy to feel and indicates that a fish (generally a pollack in this case) has struck at the fly, a knot or even the fly line itself. If I'm lucky the first tap will result in a hooked fish: the rod will bow and the reel check will sing as a pollack plunges back to its kelpy home. After this first bite there may be a short spell of fishless casts but gradually the bites will become more and more frequent. I'll waste a bit of time taking pictures of my catch for the blog, all the time thinking that I should be getting the fly out there again while they're ON. During the peak feeding spell I'll often get several takes on every retrieve and usually there'll be a period when I'm getting a fish every cast. At times there will be mackerel mixed in with the pollack. They fight harder and faster and may take a while to subdue. Unless I want one for livebaiting (which puts a stop to the fly fishing) I shake them off and continue casting. 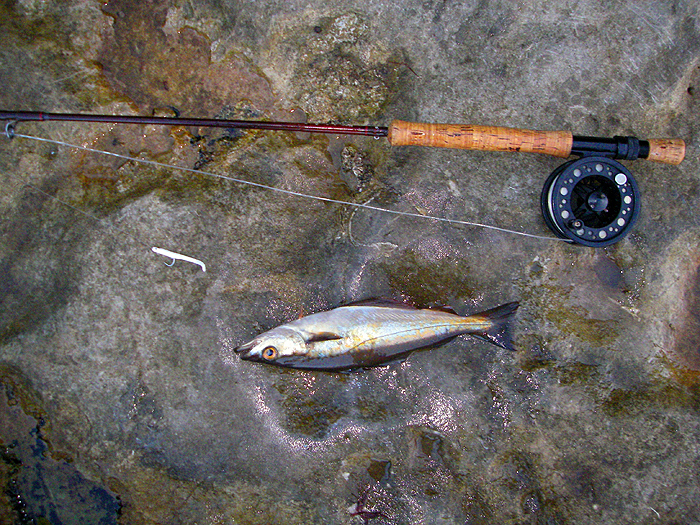 Other species which take the flies not infrequently are scad (generally in the dark), garfish (buggers to hook) and bass (which really make the reel buzz). Of course, as in any branch of the sport, I sometimes have a blank session - but it's rare. Typically, after half-an-hour of hectic action the bites will gradually tail off just before the sun peeps up. I've noticed recently that the last few fish in the spell are generally tiny pollack of about six inches in length. Presumably the bigger fish stop feeding before the tinies do.